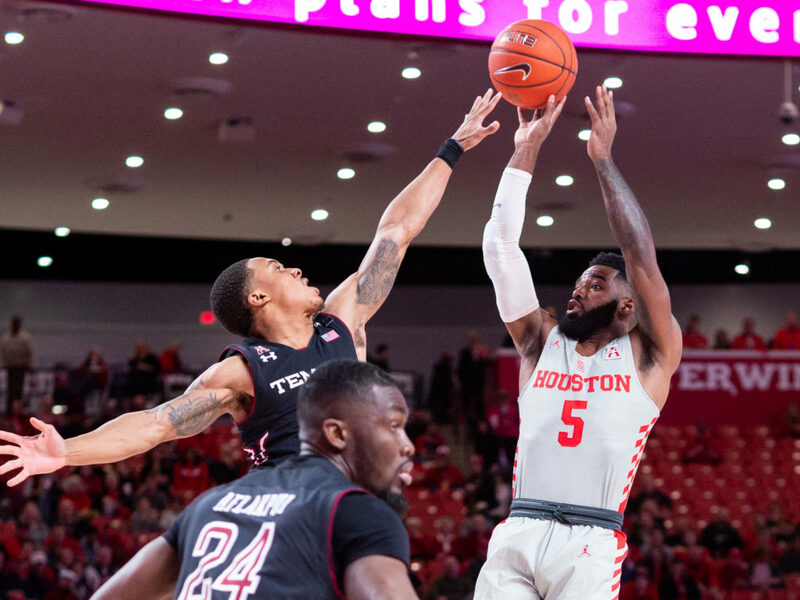 Houston’s Corey Davis, Jr. played a huge role late in the game as the nationally ranked Houston team stayed undefeated at home taking down the Temple Owls, 73-66, on Thursday. Houston gained their 21st win of the season and they got their revenge against the only team that has beaten them this year. With the Owls continuing to creep back into things late in the game, Houston had to keep their foot on the pedal. Davis was able to hit a few jumpers in the last 10 minutes to help keep Quinton Rose and the Owls from getting within striking distance. Davis also hit eight clutch free throws in the last two minutes which proved to be crucial in staying ahead. Houston was able to maintain their lead that they gained early on. They went on a 7-0 run to start the game but allowed Temple to gain the lead with eight minutes left in the first half. After that, Houston started to gain momentum and even ended the first half on an 8-2 run to go into the break leading 35-29. Fifteen minutes remained in the second half, and both teams had 40 points. Thanks to another 7-0 run, Houston found the game going their way. Rose and company could not get close enough to get another lead and ultimately lost the contest. Davis came up huge for Houston, as he ended the game with 24 points, going 12-13 from the free throw line. Breaon Brady also had a great game, ending with 13 points. For the Owls, Rose was the main contributor as he had a game-high, 26 points. Guards, Nate Pierre-Louis, and Shizz Alston, Jr. were rather quiet in the loss, combining for 14 points. Alani Moore II added nine points off of the bench, but other than Rose, Temple did not play a great game, only shooting 34.4 percent from the field. One of the huge issues was fouling. Temple committed a total of 23 fouls compared to the 13 that Houston committed. That allowed Houston to get to the line, hitting 23-36 from the charity stripe. The Owls dropped to 15-6, and 5-3 in the conference. For the first time this season, the Owls lost two games in a row. They will look to bounce back with a game against Tulane on Saturday. #13 Houston improves to 21-1 and 8-1 in the conference. They will face UCF next Thursday.